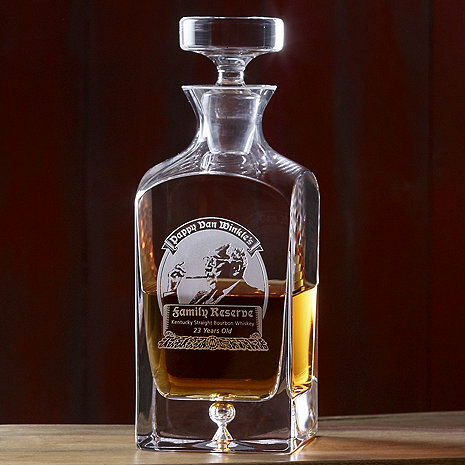 Get a piece of the heritage with this deep etched, heavy weight Decanter. Proudly featuring the iconic logo from the exclusive and highly sought-after Pappy Van Winkle’s Family Reserve 23 year bourbon deeply etched into the decanter. The heavy weight solid base glass feels great in the hand and is ideal for savoring inherent whiskey flavors and nuances. Makes a great gift for your favorite Pappy lover or bourbon connoisseur. Does the decanter come with whiskey in it ? Does this come with Pappy 23 year bourbon in the decanter? Very nice decanter. The only issue was how it was packed for shipment to us. Both the decanter and the top were loosely package and rolling around in the box. Luckily nothing was damaged. I thought it would have Pappys bourbon inside!! It turned out to be an empty decanter much to my chagrin! It was gift for my son in law- whom can buy anything he wants- by the way. He loved it! and immediately put some bourbon in it that he already had, but was not Pappy! I felt it was the best gift for him. Very nice decanter. Impress your friends, even if you don’t have Pappy in your bottle. I am very sorry for any delay. I have no record of a return on your order. Please feel free to email us the return tracking information at custserv@wineenthusiast.net, so that we may proceed with your credit.